As unemployment drops, companies face tough competition when hiring new employees. We surveyed recent hires to learn what it takes to complete the recruiting process successfully. To hire top employees, companies must adapt to the challenges of the current job market. We’re currently living in a job seeker’s market, according to recruiters. With unemployment at a 30-year low of 4.1% in 2018, most workers already have a job they’re satisfied with and aren't currently seeking a new job. In many industries, there are currently more open positions than there are candidates to fill them – presenting a significant challenge for companies that are currently recruiting. We surveyed 507 people who started a new job within the past six months to learn more about their experience searching for work in an employment market that favors them. You can use this report to better understand how your company can successfully compete for new talent. Nearly 1 in 5 recent hires (19%) say they only applied to their current job during their most recent job search, with 33% saying they applied to 2-5 jobs total. Nearly all recent hires (91%) say the interview process influences their overall opinion of a company, including 40% who say the interview process strongly influences their opinion. This can impact a company’s reputation. More than half of recent hires (58%) say their last job search lasted 2 months or less. Nearly half of recent hires (43%) say they received a job offer less than 2 weeks after beginning the application process. Only 1% of recent hires accepted a job after more than 6 months of interviews. More than half of recent startup hires (55%) say they received an offer within 2 weeks of beginning the application process at their current company, compared to slower recruiting processes at small businesses (47%), medium-sized businesses (37%), and large businesses (41%). Only 41% of workers seeking technical roles apply to 5 or fewer jobs, signaling tougher competition for companies. 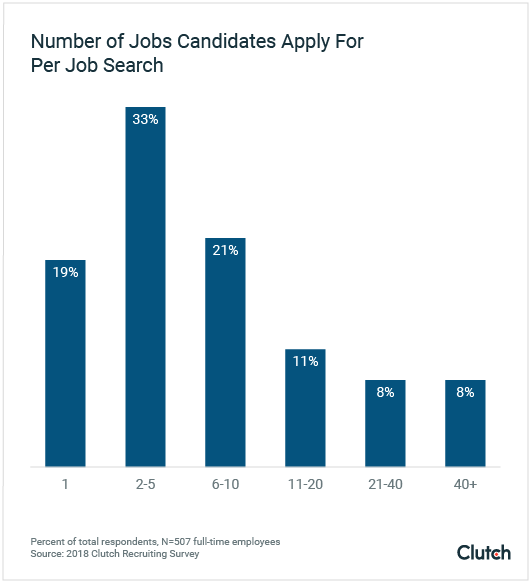 Most job seekers are selective about which jobs they apply for while searching for their next role. In fact, more than half of recent hires (52%) say they applied to 5 or fewer jobs during their most recent job search. Only 21% of candidates apply to 6-10 jobs before landing their next role, with even fewer job seekers applying to 11 or more jobs. Among the 19% of recent hires who applied to only their current position, it’s likely a recruiter persuaded them to leave their current role for a new opportunity. Because the job market favors employees over companies, recruiters must work hard to persuade employees to consider new opportunities. Among candidates who are hired through a recruiting firm, most are executives or senior employees with highly specialized skills. In San Diego, Chief Operating Officer Jan Hudson seeks candidates for roles in life sciences, healthcare, biotech, pharma, and other related industries at Surf Search, a recruiting company. She finds it is challenging to sell potential candidates on why they should consider leaving a job they enjoy. Companies that seek employees who are advanced in their careers may need to hire a recruiting firm to locate and persuade ideal candidates who aren’t currently looking for a new job. Because candidates apply to relatively few jobs while searching, companies must work hard to attract their attention. Because recruiting is more competitive, your company’s reputation matters more than ever. Nine in ten people (91%) say the interview process influences their opinion of a company, including 40% who say the interview process strongly influences their view of a company. Only 9% of people say the interview process has no impact on their opinion of a company. For many candidates, reading online reviews on Glassdoor, Yelp, Google, and other review platforms is now an essential step in the process of finding a new job, especially once they secure an interview. Because candidates rely on these sites in their job search, it's essential for businesses to pay attention to their reviews. 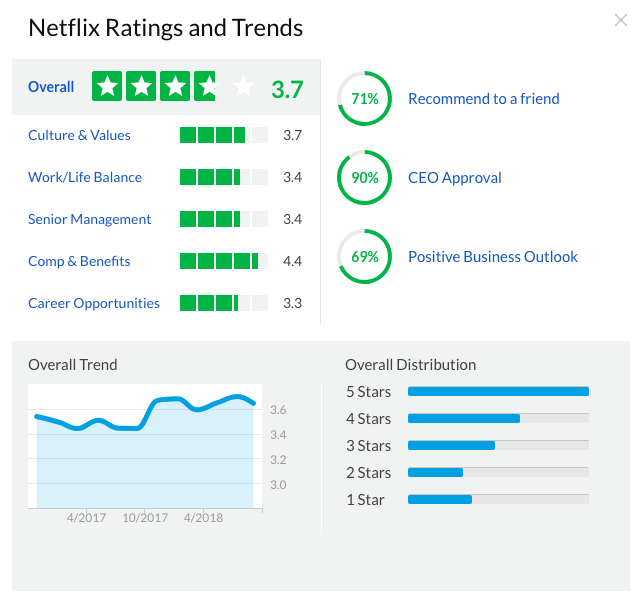 If your company has negative online reviews, especially on Glassdoor, candidates appreciate reading personal responses from the company. A representative from your company should thank negative reviewers for their input and provide insight into how your company is taking steps to address concerns. If your company has experienced a high-profile problem with its reputation, such as financial instability or high turnover that is now resolved, you can also hire an online reputation management or social listening partner to improve your company’s online presence. Finally, recruiting experts urge companies to court candidates they are eager to hire. “Candidates want to make sure that the company they’re evaluating wants them just as much as they want the job,” Gardner said. When recruiting for senior or executive roles, recruiting experts say thoughtful touches matter. For example, if a candidate is considering relocating, your company could provide a personal introduction to a local real estate agent. For junior roles, something as simple as a warm call from a company leader can go a long way. 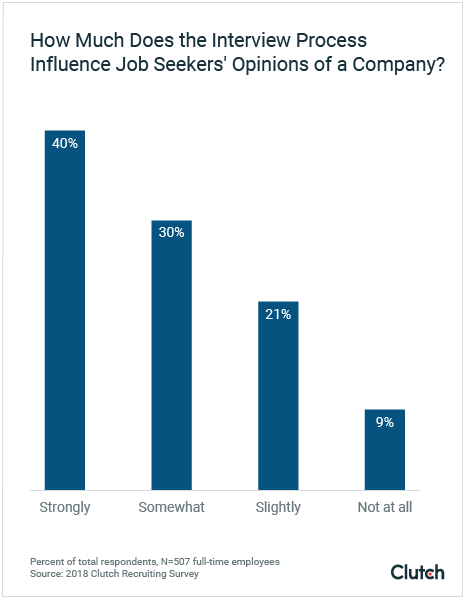 When job seekers are considering multiple job opportunities, they are more likely to select the company that seems the most enthusiastic about hiring them. Your company can improve its overall reputation through the recruiting process by improving your online presence and courting candidates. You risk missing out on hiring top candidates if your company’s recruiting timeline is too long. 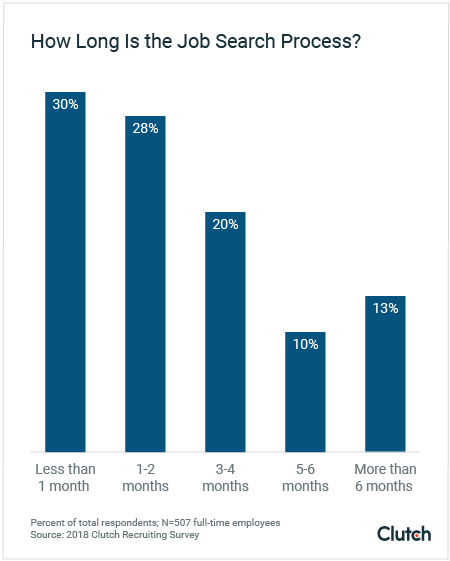 More than half of recent hires (58%) say their job search lasted 2 months or less. Just 8% of candidates spend 7-12 months searching for a job, while only 5% spend more than a year looking. For companies, positions that are open for more than a few months can signal problems in the recruiting process. “The most difficult roles to fill are the ones that have been hanging out there forever,” Hudson said. Sometimes, companies exhaust the local pool of potential candidates but remain unwilling to provide relocation assistance or remote work options to broaden their search. Location: Offer relocation assistance or the option to work remotely. Compensation: Ensure that you offer a salary at or above market rate. Title: Write competitive, descriptive job titles, which are more likely to attract candidates. Finally, if multiple members of your company are interviewing candidates in your pipeline, ensure that everyone is aligned and looking for the same skills and qualities. Confusion about priorities can lead to unwanted delays. Job seekers aren’t on the market for long, so your company should be prepared to move quickly, too. If your company’s recruiting pipeline contains too many rounds of interviews, a candidate might accept another company’s offer before your recruiting process is complete. Nearly half of recent hires (43%) say their current employer presented an offer within 2 weeks of beginning the interview process. 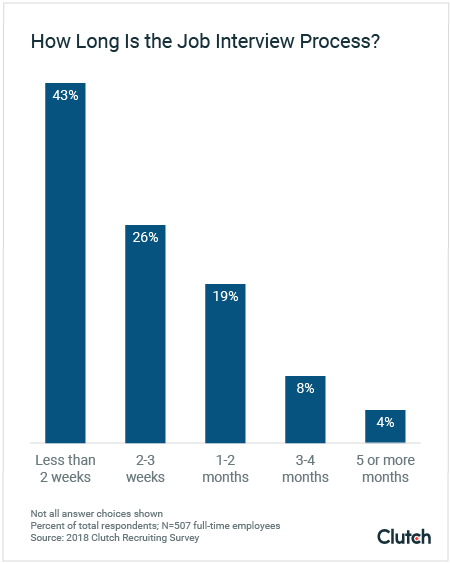 More than one-quarter of recent hires (26%) say their current job presented an offer in 2 to 3 weeks. Once a recruiting process exceeds 1 to 2 months, it’s increasingly likely that a candidate has already accepted another offer from a company that simply moved faster. Companies with long interview processes must recognize that candidates are sometimes faced with difficult choices. Companies with a shorter interview process are the most successful at hiring their top recruits — only 1% of recent hires say they accepted a job after the recruiting process dragged on for more than 6 months. Companies can hire candidates more quickly by condensing or removing stages in the interview process. Although trends in recruiting can reveal insights for all businesses, patterns vary by industry and company type. Our survey captured trends in the average length of a job search to highlight what competition and timelines businesses should expect while recruiting. Facebook founder Mark Zuckerberg once urged startup leaders to “move fast and break things.” In recruiting, it’s no surprise that startups tend to hire more quickly than other types of businesses. More than half of recent startup hires (55%) say they received an offer within 2 weeks of beginning the application process at their current company. Startups are defined as fast-growing companies with 100 or fewer employees. Small businesses with fewer than 250 employees also tend to move quickly to hire the talent they want. Nearly half of recently hired small business employees (47%) say they also received an offer within two weeks. Large businesses with more than 500 employees gave 41% of applicants an offer within two weeks, while only 37% of medium-sized businesses with 250 to 500 employees made their recent hires an offer within two weeks. Companies that move slower in the recruitment process risk losing talent to their competitors. Catherine Giese, a recently hired SEO associate at financial services startup Fundera, knew most startups prefer to make quick hires when she began her job search near the end of her senior year of college. She began sending out applications in mid- to late-April with hopes of an early summer start date. Within days of applying, she heard back from Fundera. Ultimately, Giese took the job at Fundera because it matched her goals and moved faster in the recruitment process than other companies that may have been interested in extending an offer. Companies with less structure tend to have more agile recruiting timelines, according to experts. At larger companies, recruiting might begin in a human resources or talent acquisition office, and hiring managers may need to gather consensus from half a dozen colleagues who might have competing visions for the role. In addition to this time-consuming internal discussion, additional rounds of interviews are subject to the complexity of scheduling. Instead, experts recommend that a hiring manager serves as an authoritative decision-maker, with feedback and consensus from no more than three or four colleagues. Larger businesses that are interested in attracting dynamic candidates away from the startup world should emulate startups’ agile recruiting process. In the final stages of the recruiting process, companies face more competition when a potential employee applies to a larger pool of jobs, increasing the risk that they will receive a more desirable offer. We found that only 41% of workers seeking technical roles apply to 5 or fewer jobs. Among new hires, 13% only applied for their current role. Nearly 1 in 5 people seeking jobs in technical fields (19%) applied to 6-10 jobs before landing their current position. Employers in business, financial, and legal fields, as well as employers in retail and hospitality, face slightly less competition while hiring because job seekers in these fields are likely comparing fewer options. Among recent hires, more than half (54%) applied to 5 or fewer jobs during their search. Educators are most likely to apply to 5 or fewer jobs, with 63% saying this matched their job search. Healthcare workers and those in science roles are also likely to apply to 5 or fewer jobs, with nearly half (48%) saying this applies to them. Overall, companies should be aware of trends in their industries. If it’s likely that your target candidates are applying to more jobs, you should be prepared to move faster and make more competitive offers than the other companies your top candidates might be tempted to join. Low unemployment means that companies face tough competition during the recruiting process. As candidates apply for fewer jobs, companies must work harder to be noticed in a crowded field. Reputation matters more than ever, and candidates say the interview process impacts their overall opinion of a company. To win talent in this environment, companies should streamline their recruiting processes by limiting the number of interviews and emulating the agile approach startups take. Companies must also offer compelling opportunities, such as an above-market salary or the option to work remotely, especially in competitive industries such as technical fields. To hire top employees, companies must evaluate their current hiring practices and consider updating them to reflect the state of recruiting today. Clutch surveyed 507 full-time employees who started a new job within the past 6 months. Respondents work in a variety of settings, including large businesses with more than 500 employees (35%), medium businesses with 250-500 employees (20%), small businesses with fewer than 250 employees (19%), startups (17%), and miscellaneous other businesses (9%). A range of industries were represented, including retail/hospitality (21%), healthcare (16%), technical services (10%), business/legal/financial (9%), education (9%), government (5%), advertising/marketing/PR/media (5%), and miscellaneous other (25%). Respondents came from all regions of the United States: South (47%), Midwest (21%), West (16%), and Northeast (13%). Women (69%) and men (31%) were included in the survey. Respondents ranged from millennials aged 18-34 (66%), Generation X aged 35-54 (29%), and baby boomers aged 55 and over (5%).